Welcome to our July Newsletter on How to Deal with Running Pain! We hope you are enjoying a great summer of running and taking part in some of the many races that seem to fill the summer months. As of 1 July, 2014, our website has been optimized for mobile devices. You can now more easily read all our articles when you are on the go with your mobile device. We hope this month's article helps you deal with and maybe even overcome running pain. As always, we would love to hear from you. Please add your feedback, comments and suggestions below. "...life is at least 50 percent pain. If we do not relate to pain, we are not relating to half our life...When we are able to work with pain and understand it, life becomes twice as interesting. Relating to pain makes us more fearless and happy." How we deal with running pain is often how we deal with life. 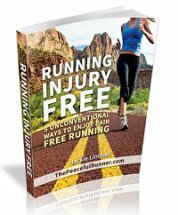 If we can practice accepting running pain and aches without fear, we can help avoid running injuries and develop a coping strategy for all areas of our lives. If we experience serious pain while running, of course we should stop or else we will hurt ourselves even more. However, most pain felt while running is not so serious. We may experience side stitches, belly cramps, leg cramps, blisters, an ache in our back, neck, shoulder or one of our knees, a twinge in our hamstrings, chafing, etc. We may also experience the pain of tired legs, exertion from running fast or up a hill, or the mental strain felt when thinking about how much further we have to run. The list goes on and on. How we deal with running pain is often how we deal with the emotional pain in our lives. "The first step is to acknowledge the pain. The pain is one thing, and the mind reacting to the pain is another, so the second step is not to overreact. Becoming startled by the pain only exacerbates the pain, like throwing gasoline on a fire: our reaction to the pain makes it even worse. Therefore we acknowledge the pain, but we avoid having the immediate reactionary response." When we experience running pain, we need to accept it rather than resist it or try to ignore it. Trying to ignore pain takes great mental effort which can lead to mental and physical exhaustion. We need to stay calm, breath into it and relax with the sensation. We need to allow the pain to be felt without overreacting and acknowledge it for what it is—a sensation in the body. Pain is mostly a mental problem and it is only difficult because our minds cannot handle the pain. Sakyong recommends that we try to feel the difference between the pain itself and our mind's inability to handle the pain. No pain is permanent. When we realize that nothing in life is permanent, we can much more easily accept all things we encounter in life whether this is pain while running, difficult life situations, our emotions, and even our bodies. Everything in life is temporary. When we learn how to handle running pain, we feel confident and we no longer have a fear of pain. Pain also provides us with an opportunity to grow. As pain often arises from an imbalance in our bodies, we can learn how to correct the imbalance and move beyond it. Pain can also teach us genuine compassion towards others. As we experience pain, we can better relate to others who suffer from pain on a daily basis. 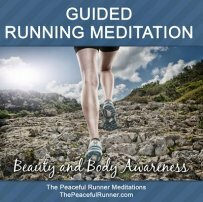 Running and meditation are similar in numerous ways. When we do either, we come face-to-face with ourselves in silence and we must deal with whatever arises either in our minds or bodies. Many runners struggle with their thoughts while running so they try to shut off by listening to music or chatting with others. Some runners will not run at all unless they have a distraction of some sort. Running and meditating are also similar in that aches and pains often arise in our bodies that we have not felt before. When meditating we practice acknowledging our thoughts and then letting them go without forming an attachment to them. We can do the same with the sensations we feel in our bodies. The pain we feel in our bodies can be released easier if we accept and feel them without fear, attachment or overreaction. As we learn to deal with the pain of running, we will be better able to deal with all situations that arise in our lives and we will be happier and healthier because of it. 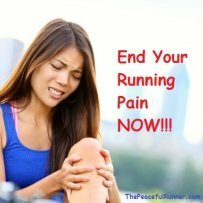 How do you deal with running pain? Have you tried this or any other technique to alleviate pain or the fear of pain? Please add your comments below. Back to top of How Do You Deal With Running Pain?